There appears to be a lot of mystery and misunderstanding surrounding vermouth. Whilst often treated like a spirit, it is not. It is a ‘fortified wine’ which means it must consist of a minimum of 75% grape-derived wine, fortified to between 14.5% and 22% alcohol via the addition of pure spirit. ‘Spirits’ like Gin and Vodka are produced via distillation and usually contain around 40% alcohol and therefore are not suited to drinking on their own unlike vermouths. In addition, according to the style any producer is aiming for the fortified wine is sweetened via the addition of sugar and, of course, ‘flavoured’ with selected botanicals (herbs, spices, citrus peels)…one of which must be ‘wormwood’, from which the name ‘Vermouth’ is derived. Therefore there are two main components of vermouth – the wine and the botanicals. The former tends to get very little attention despite the fact it comprises over 75% of the product – but does, we believe, have a key role to play; contributing to the unique flavour profile of our Vermouth and firmly plants it’s origins in Sussex. The latter is where the artistry and ‘Italian magic’ lie! Blending the complex array of flavours from 40 botanicals takes time and patience and we believe we’ve come up with a unique and delicious recipe that produces a drink that is both pleasing on its own, as well as perfect as a partner in many a cocktail. Whilst we can’t give away our secret blend, some components you’ll be familiar with and we’ll be growing on the Estate soon (e.g. Rosemary, Thyme, Wormwood). Several different styles of vermouth exist – typically Red Vermouths are sweet and come from Italy (e.g. Martini Rosso, Carpano Antica Formula)- the red, or really brown, colouring originating from the addition of caramel, and White Vermouths which range from sweet (Cinzano Bianco, Dolin Blanc) to dry (Noilly Prat, Dolin Dry). But please be aware, ‘Dry’ in Vermouth terms is all relative…the drink will still contain 30 – 50g/L of sugar….whilst the Sweet ones contain over 130g/L. 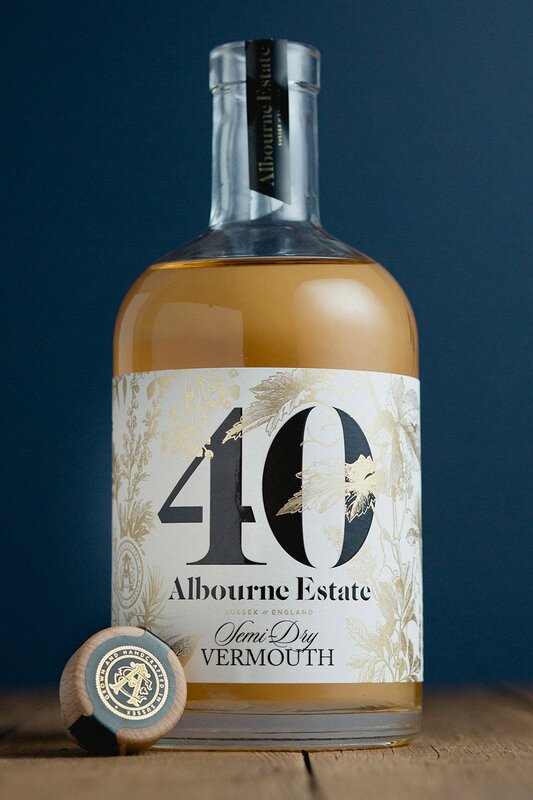 Our ‘40’ Vermouth contains 75g/L of sugar so is classified as ‘Semi-Dry’.